Get the CBSE Class 10th Mathematics Chapter 1, Real Numbers: Important Questions & Preparation Tips. Get the CBSE Class 10th Mathematics Chapter 1, Real Numbers: Important Questions & Preparation Tips. This will provide you with a very clear idea about what type of questions are being framed for the exam and from which topics. The pattern in which the Question Paper is set is quite different from the style in which the course structure is actually defined. Consider the below mentioned points/questions at the time of preparation. Given positive integers a and b, there exist whole numbers q and r satisfying a = bq + r, 0 ≤ r < b. Step 1: Apply the division lemma to find the whole numbers q and r such that, a = bq + r, where ; 0 ≤ r < b. Step 2: Now if r = 0, then the HCF of given numbers is b. If r ≠ 0, then apply Euclid’s lemma again to b and r.
Step 3: Continue this process till the remainder comes out to be zero. The divisor at this stage will be HCF (a, b). Also, HCF(a, b) = HCF(b, r). 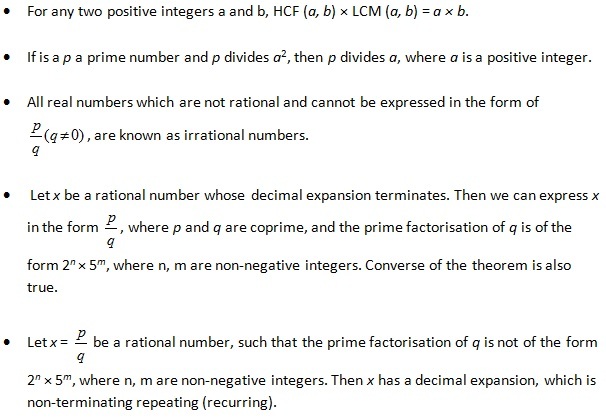 The Fundamental Theorem of Arithmetic: Every composite number can be expressed (factorised) as a product of primes, and this factorisation is unique, apart from the order in which the prime factors occur.